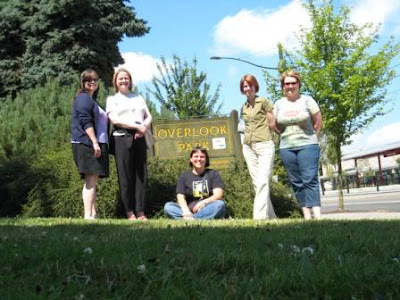 Each year, Patricia chooses five parks in Portland—one from each section of Portland: N, NE, NW, SE & SW. She plans food and invites people for a picnic, then records the festivities. By 2027 she will have picnicked in every park in Portland. Present: Kelly, Heidi, Patricia, Jan & Nicole. Food: Delights from Salad, Delights from Whole Foods, more salad and carrot cake. Comments: I love Overlook park. 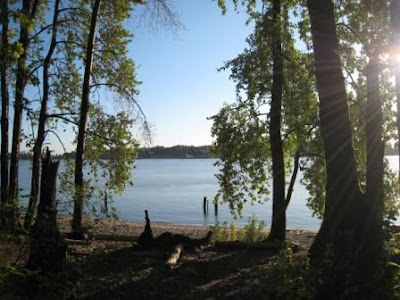 It (not too surprisingly) overlooks the Willamette River and the North and NW industrial area. It is particularly beautiful at sunset, not too crowded and has a lovely running track. 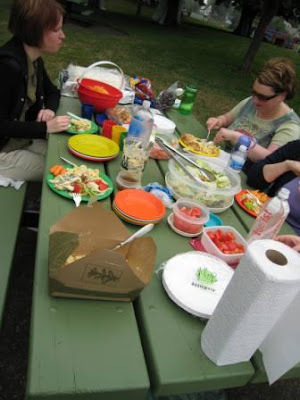 We had this picnic as a between-two-birthdays picnic. Jan’s comes first near the end of July and Kelly’s is in the first of August. We chatted, ate food, waited for the sun to come out (Worst. Summer. Ever.) and then played a smashing game of croquet. 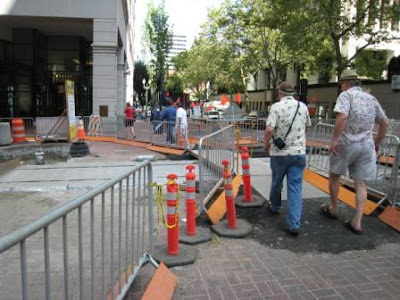 Trimet has this bright idea to run a new Max line down the middle of the Bus Mall. AND open it to car traffic. I think this is colossally dumb, as does everyone I know who rides public transportation. I think that the converging of all three of those modes of transportation will be a disaster. But Trimet is undeterred, so our Bus Mall has been interrupted for 2 years. despite the annoyance of construction, it’s very interesting to walk around and see what is going on. 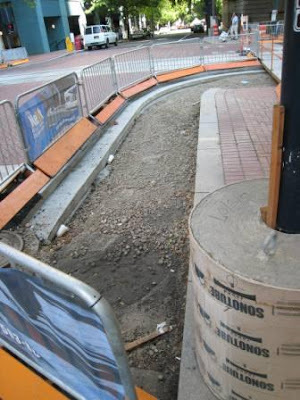 It looks like here they are installing bump-out sidewalks on this corner. 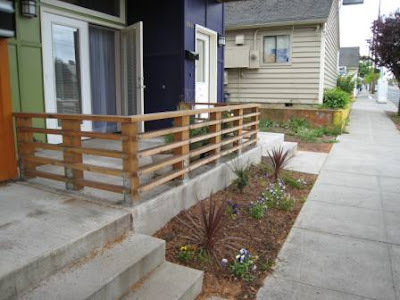 Portland is in love with bump out sidewalks, because they allow pedestrians to see oncoming traffic without peering around cars (and huge SUVs). 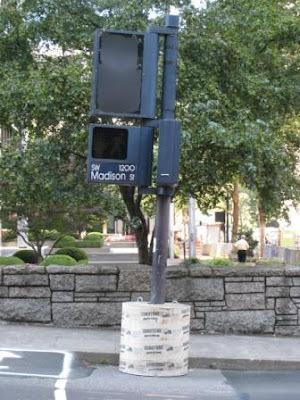 This is one of my favorite things in the bus mass construction. They have moved all the cross walks back from the intersection 10-15 feet. And they still needed the street signs to tell us to walk/don’t walk. Solution? Cut those suckers off, drop them in a round of cement, spray paint some white lines on the street and Voila! New crossing. New Max tracks going in. The sign in the background says what businesses are open on this block. Merchants are grumpy, because business is down. 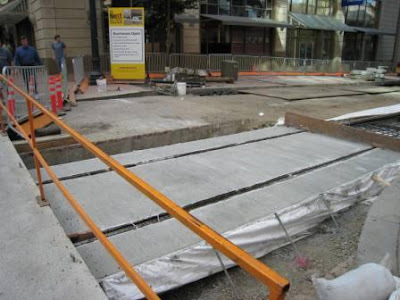 Another favorite of the downtown construction process. And I mean that sincerely. As they lay the tracks down, they also put down these temporary bridges. When they were constructing near my school, I never knew where the crossing would be. I also feel like an urban Lewis & Clark crossing the makeshift bridge. It makes a pleasant metal “thunk” when you walk across it. 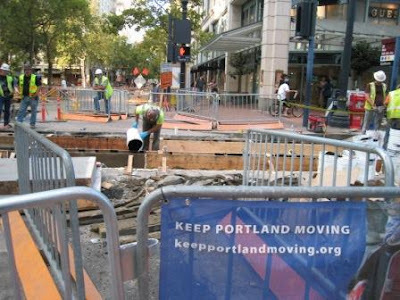 This weekend, they shut down all downtown Max service so that they could make the new line and the existing lines cross. The new line runs perpendicular to the existing lines. It was interesting to be downtown and see all the activity. I went on a short walk this morning. I like walking in the mornings as I can wander about and see what’s going on in the neighborhood. I usually walk very early, before most people are out and about, and I really enjoy that because I can indulge in my very nosy-parker behavior. Early in the morning you might find me with my nose pressed up against a fence so I can see what’s going on in someone’s back yard. Or leaning over a shorter fence trying to figure out what kinds of vegetables people are growing. Today I got started later than usual, so I couldn’t do that. Today though, I checked out “my” garden lots. 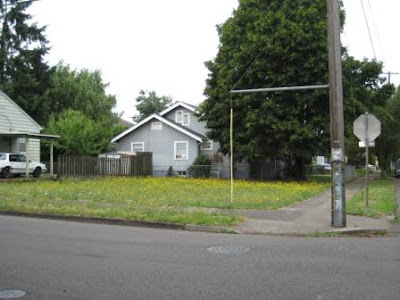 I have this idea that it would be fun to buy an empty lot and make the whole thing my garden. This is one of those delusional ideas that isn’t based in the real world because 1) I already have trouble keeping up with the tiny garden I have now and 2)The amount I would spend on the lot would buy me truckloads of fresh, organic produce. Still, a girl likes to dream. 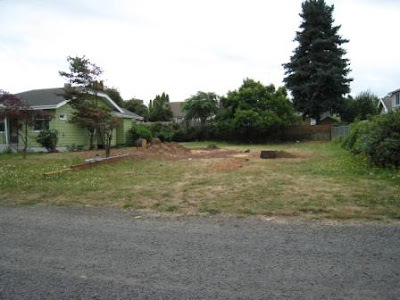 This lot, I initially rejected, because there were two huge Douglas fir trees that made the yard totally shady. However, I noticed last week that the trees were GONE! I could totally have a garden here. 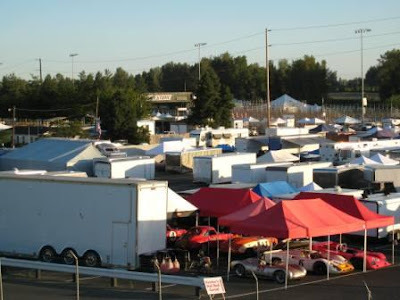 This lot is actually for sale and someday I may call the number to find out how much it costs. This is the other lot that I would love to make into a garden. 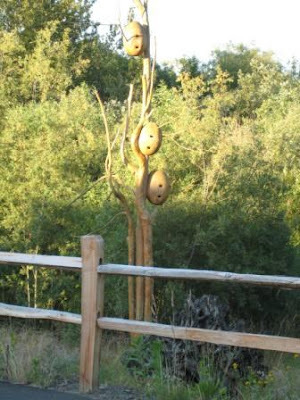 I envision fruit espaliered along the edges with a lovely gate to go through and then many, many neatly tended garden beds. This lot isn’t for sale, but I am watching. And what do you do when you have to chop down your tree? 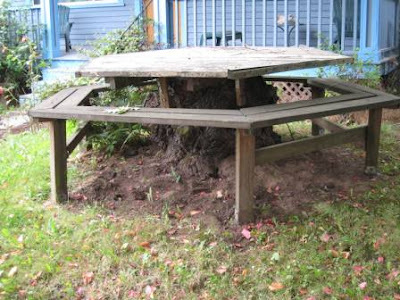 Most people would dig out the stump, but these people made a nice picnic table. We have this great front porch that we have yet to embrace. One problem is that there is so much to do in every other region of the house, there hasn’t been time to find a way to embrace the porch area. But also, it’s so public. It’s really close to the sidewalk, which is a moderately traveled sidewalk. Kelly and I ate dinner out there, and one guy stopped to talk to us. Which is nice, but also kind of weird, if you don’t really want to chat. Plus, with it bare like it is right now, it isn’t really marked as ours either. The other night, Matt looked outside and people were sitting on our porch. When he stuck his head out the door, their excuse was, “Oh, sorry, we thought this was a business.” He asked them to sit somewhere else. A few weeks ago, I had a vision of what would help. 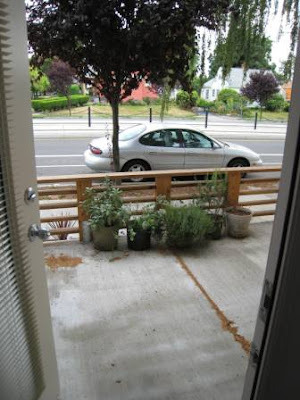 My idea is to install a 12-inch planter across the whole front of the porch on the inside where those potted plants sit now. Then, attach a fairly open, yet tall lattice to the back. 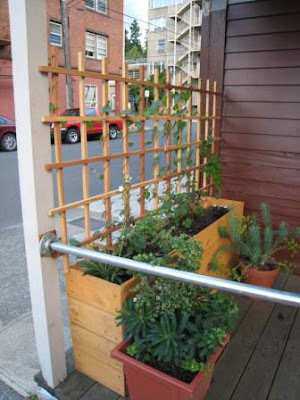 Runner peas and beans could be planted in the planter box and grow up to form a bit of a shield between the public and the private. 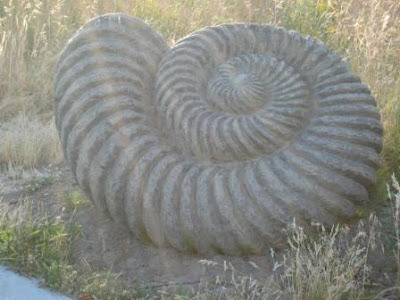 When I was on a walk, I saw that someone had already created something like I wanted. Posted on July 22, 2007 February 9, 2016 Categories All (-ish), StructuresTags houses2 Comments on Porch conundrum. My mom is sick right now. She had some complications from diverticulitis and ended up in the ICU and having surgery early Thursday morning. She’s out of ICU and into a normal hospital room right now. Last night we watched Jeopardy and did part of a crossword puzzle. 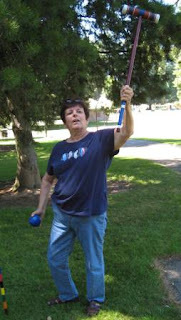 Hopefully, she will be better soon so we can play croquet again. Posted on July 20, 2007 January 28, 2016 Categories All (-ish), To Occupy my TimeTags family1 Comment on Ill-health in the family. It’s been raining a lot here this week. Wednesday I thought I could get away with riding my bike to work with just my rain poncho. Then it started to pour and I was soaking wet from the thigh down and the neck up. This was serious, February rain. Though much warmer. It was nice to get to work, towel down my hair, and be snugly inside when the rains came again mid-afternoon and I snapped this picture. Kelly and I rode The Night Ride. It started at 9:00 p.m. (much better than the midnight start it used to have.) We started at Union Station, and rode out to North Portland and back. At the end, there were donuts. Mmmmmm. Donuts. 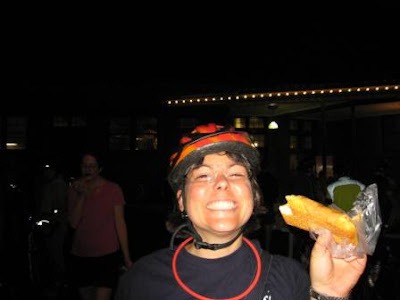 It was a 15 mile ride in all, and there were two rest stops, one that was a movie rest stop, with popcorn to eat, and one that was a disco party where they gave out candy. 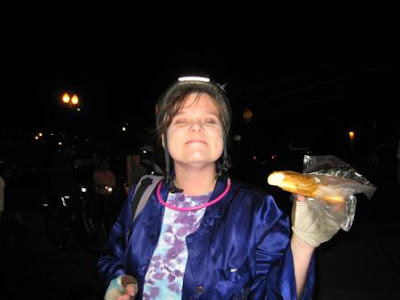 The ride was a fundraiser for the Bicycle Transportation Alliance, but the best part was the glow-in-the-dark t-shirt. Kelly and I at the start. 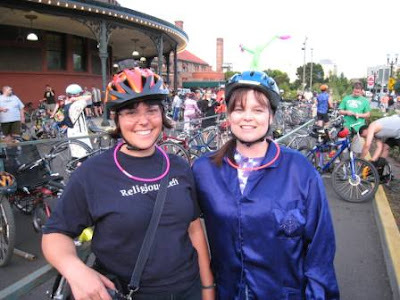 The glow-things around our neck were what we wore in lieu of race numbers. I’ve been watching this war for a year or so now with much amusement. 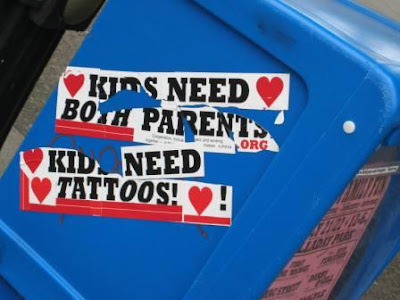 Someone who felt strongly about kids needing both parents decided to print up a bunch of stickers and plaster them all over downtown. 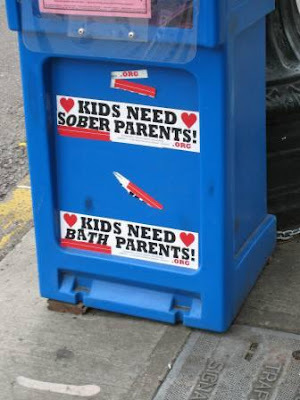 Many, many newspaper boxes have these stickers on them. I’m assuming that this person means one father and one mother. Someone else also feels strongly about the issue. Bit by bit, they cannibalized the original stickers to change the meaning of the originals. 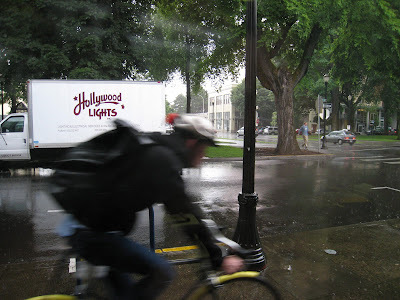 In which I attempt to ride all the yellow, green, blue & purple streets on the Bike There Bike Map while increasing strength, stamina, aerobic capacity and exploring Portland’s Nooks and Crannies. Weather: Sunny with a breeze. Wonderful summer. This is a great ride if you aren’t in the mood for stoplights. Also, it is almost entirely separated from the general traffic, so it is a good one for families and people less into biking. Also, there is wading at Kelley Point Park. I wasn’t in any hurry so I wasn’t riding quickly. More accurately, I couldn’t muster up the enthusiasm for any fast riding, despite the fact that I had all of the trails to myself. I am clearly in no-hurry vacation mode. It was about the amount of time I was looking for, though. The sewage treatment facility was a bit stinky today. I hadn’t been on the bike/ped turnoff to Smith and Bybee Lakes before. It appears to be a road that has been blocked off. 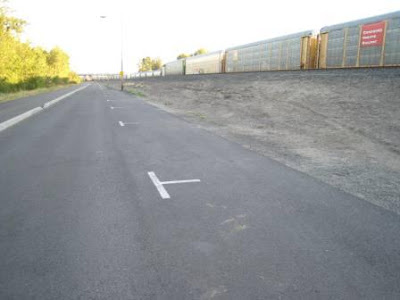 Also a parking lot for train cars that aren’t going anywhere at the moment. After riding through the lake areas the trail rejoins Marine Drive, though there is still a bike path next to the high traffic Marine Drive. 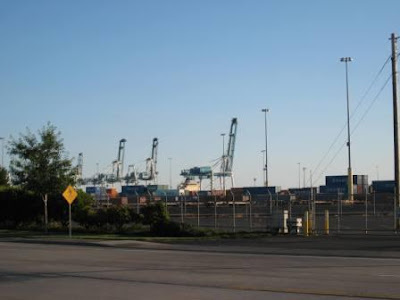 Marine drive has acres of industrial areas. 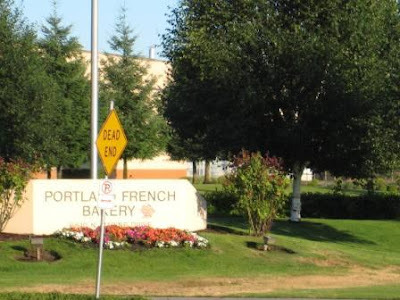 I saw manufacturing and distribution for Rodda Paint, Honda, Portland French Bakery and more. It doesn’t look much like a cute little French Bakery, eh? The turnoff for Kelley Point Park is suddenly just there and you make the turn. After a brief time pedaling, the sound of the cars on Marine Drive fade and there are tall trees all around. The path takes you around the point. There are a lot of good access points to the water, but there are no lifeguards and you would be swimming in the river. There are many “No Lifeguards, swim at your own risk” signs. 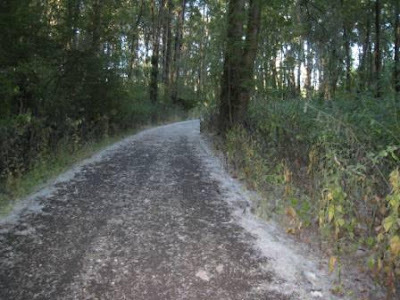 There was cotton from the cottonwoods all over the path. It’s that time of year. 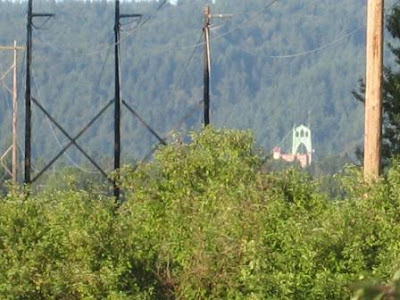 Coming back, I caught a glimpse of the St. John’s Bridge through the trees.